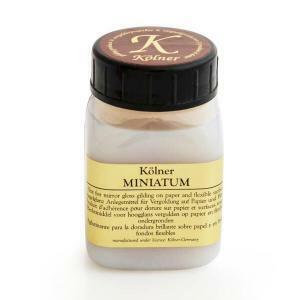 Kölner Miniatum Size for high gloss for gilding on paper, vellum, leather and flexible surfaces. 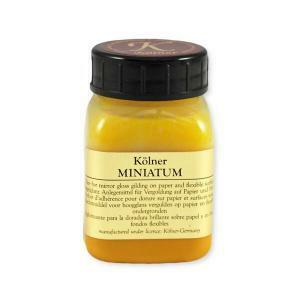 Kölner Miniatum products are developed for the gilding of paintings and writings (calligraphy). It is easy to use. Apply, let it dry and metallize it with transfer gold within the next 24 hours. Product feature: On the basis of a watery, glycol-containing acrylic dispersion. It contains small quantities butylcarbitol. Make sure sthat there is sufficient ventilation while working with this product!